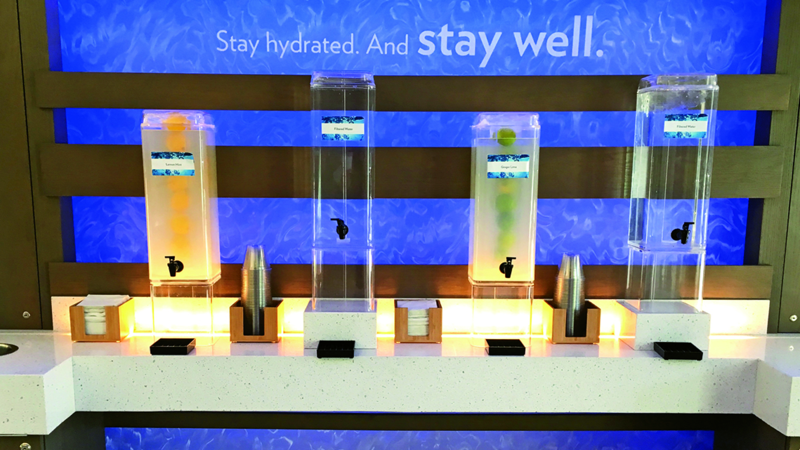 When InterContinental Hotels Group's Even hotel opened in Brooklyn, N.Y., in August, it brought with it the nascent hotel brand's concept of enabling wellness in travel: workout equipment in every room, hydration stations in the lobby and on every other floor, a high-end fitness center, living walls, organized runs through the local streets and mostly healthy menu items. What the hotel doesn't have is a spa, and in that regard, the Even brand is a prime example of the ways current wellness trends are turning hospitality on its head. In the 1980s and '90s, wellness usually meant a one-hour massage followed by a steam and sauna. The aughts gave way to the addition of yoga, Pilates and spin classes. Over the last few years, people in search of true wellness experiences are demanding much more, and the travel industry is responding. "Even is 100% wellness focused and has no spas," said Beth McGroarty, director of research for the Global Wellness Institute (GWI). "The pillars of what they think of wellness are fitness inside and out of property, healthy food, healthy sleep, inspirational messages. It's an example of how wellness and spa aren't always married." McGroarty pointed out that the new wellness tourism model is more comprehensive and often includes not just fitness and yoga classes on-site, but nutritionists, mindfulness programs and sleep programs. With brands such as Six Senses and 1 Hotels, the wellness concept is an integral part of the way their properties are designed, built and managed. Increasingly, it makes financial sense to incorporate wellness. GWI recently reported that wellness tourism revenue grew 14% globally, to $563 billion, from 2013 to 2015, and projected that the category would grow another 37.5%, to $808 billion, by 2020. The attraction is especially appealing to the larger travel industry, because the surge in wellness travel is higher for secondary wellness tourism -- services that are sought during travel but where wellness is not the main purpose of the trip -- than for primary wellness tourism. But in addition to revenue, the changing sector also brings with it a host of challenges. At this year's Global Wellness Summit in Tyrol, Austria, McGroarty said, the travel industry grappled with how to invest in new wellness trends, which unlike cookie-cutter spas are difficult to scale and replicate on a brand level. While a spa can be reproduced at hundreds of properties, McGroarty said, the current wellness model has "more moving pieces." "It's complicated," she said. "In Africa, you want to have African cultural experiences, food, treatments and therapy. Even if it's a replicable model it has to be customized for each location. Travelers want authenticity. They want to be in the place. They don't want some generic experience they could have in Minnesota if they are in Dubai." The best approaches might be coming from the bottom up, as hotels, cruise lines, tour operators and travel agents tackle the vast wellness model on an individual level and with their own brand identities.